(Pennsylvania, 2019) viii + 336. Reviewed by Richard Gravil on 2019-04-13. This further instalment of Tim Fulford's thinking about late Wordsworth follows his two excellent chapters in The Late Poetry of the Lake Poets (2013). That book examined the efforts of Southey, Coleridge, and Wordsworth to reinvent themselves after Jeffrey's sustained assault on the poetics of the Lakers. In Wordsworth's case, Fulford argued, this took the form of turning himself from subjective nature enthusiast to topographer and guide, foregrounding public rather than private associations, and voicing acceptably generalized sentiments (of the kind Jeffrey thought essential to poetry), as in "Ode. The Pass of Kirkstone." Fulford's powerful reading of the "Long Meg" sonnet and of the 1832 Tour poems showed Wordsworth as a custodian of "sacred Britain," articulating a complex notion of national history. In this new book Fulford considers a selection of shorter poems in a series of discrete essays on different topics. Reading these poems with extraordinary critical finesse--close reading carried to the ultimate pitch of attention--he aims to create an audience for the poet's meticulous craft. He fortifies his arguments with impressive attention to manuscript development; alertness to and extensive exposition of Wordsworth's dialogues with Virgil, Milton, and Cowper, as well as with Scott, Hogg, and other contemporaries; much deft and detailed historicism; considerable biographical awareness; and a fine sense of Wordsworth's continuing experimentation with genre--experiments conducted under cover, as it were, of conforming more closely to readerly expectations than in the maligned poetry of 1793--1807. But Fulford nowhere considers directly whether that poetry should have been maligned, whether Wordsworth's change of course after 1807 was altogether desirable, and how culpable Jeffrey might be for the change. Each of the four parts of this book has its own preface and two chapters, though the rationale for grouping the chapters is sometimes puzzling. Part 1, "Producing a Poet for the public," begins with a chapter on "Wordsworth and the Ghost of Cowper" in the 1815 text of "Yew-Trees." It is very probable that "Yew-Trees" was provoked by Wordsworth's reading of Cowper's "Yardley Oak" in 1804, though it is hard to imagine two poems about trees more different in style, mood, tone, form, and purpose. Fulford argues that Wordsworth excised the final lines of the earliest manuscript (may the "fraternal four" of Borrowdale [like Stonehenge in "Salisbury Plain"] "stand / Forever spared by Man!") to conceal his indebtedness to Cowper. It seems equally likely that Wordsworth simply wished to remove from the poem a loose and limiting moral that diluted the effect of what are now its resonant concluding lines. Since one of Fulford's chief aims in this book is to show how Wordsworth conversed with mighty poets such as Virgil, Lucan (via Rowe), and Milton as well as with Cowper and Burke, he might have said more about the presence of these earlier poets in "Yew Trees." The second chapter--"The Poetics of Patronage"--examines a set of landscape "inscriptions" composed after 1806 and reflecting Wordsworth's transformation from the heroic simplicities of Dove Cottage to the complications wrought by Sir George Beaumont's friendship and patronage. The inscriptions illustrate what happened to Wordsworth's poetry as he anxiously strove to maintain his poetic independence even while recognizing his indebtedness to an earl and a baronet. After pointedly noting the degree of "self-interested self-blinding" (46) that must have informed this friendship between the poet (himself the son and grandson of land agents) and Sir George, Fulford spends much of the chapter (48--60) exploring in detail the relationship between the Beaumonts and their tenants, workers, and agents. In the 1815 edition of his poems, Wordsworth interweaves inscriptions of 1811 intended for the grounds of Coleorton with earlier inscriptions belonging to the culture of Grasmere and Derwentwater. Since Wordsworth gives first and last place to the earlier poems, Fulford argues, "the Coleorton voice is undercut by his Lakeland determination to speak from a position of community with ordinary villagers" (87). This framing thus puts in question "the alignment of the poet with the landowner ... anxiously cultivating an independence within the very medium that declares his affiliation" (87--88). Part 2, "Spots of Space," begins with fifty accomplished pages on "Scott-land," showing how Wordsworth competed with Macpherson, Scott, and Hogg by "adapting the forms in which they versified Scottish history" while revealing "suspicion of the kind of history they constructed." In defending Burns as (like himself) a creator of narrative personae, Fulford suggests that Wordsworth credits both himself and Burns with literary sophistication greater than that of more conservative poets and the critical premises of Francis Jeffrey. The chapter also offers fine readings of "Yarrow Visited," with its "re-sounding" of the "vocal harmonies" of local poetry that Wordsworth knew from Scott, Logan, and Anderson; and of "The Brownie's Cell," read stanza by stanza with expert historical and literary placement as a "historicising, demythologising and de-Ossianising" performance (120). Finally, "Written in a blank leaf of Macpherson's Ossian" is treated to an intricate argument on what it means to inscribe a manuscript poem in a printed work that has neither manuscript nor oral authority (140). Wordsworth's poetical treatment of Macpherson's "counterfeit Remains" is described as "astonishing," a "tour de force," and "one of Wordsworth's finest achievements" (145--6). Chapter 4 ("Textual Strata and Geological Form: The Scriptorium and the Cave,") reads "Enough of Climbing Toil" in its 1820 and 1827 versions (also known as one of the two "Odes to Lycoris") together with textual "strata" going back to 1799--1800 and 1817--18. In this poem, Fulford argues, Wordsworth acknowledges his debt to his "scriptorium," i.e. Dorothy, Sara, and Mary as a team of monastic scribes. In stressing the supposed belatedness of Wordsworth's discovery that Dorothy has "a separate self," Fulford rather assumes that despite the work of Alan Grob and Lucy Newlyn, some readers might still take seriously the 1990s disparagement of "Tintern Abbey" in the heyday of deconstruction. As for the other announced theme of this chapter, geological form proves quite secondary. Except as metaphor, it occupies just one of the twenty-five pages. This argument might have been profitably developed with reference to other poems revealing Wordsworth's awareness of, and tacit assent to, Darwinist ideas. Part 3, "The Politics of Diction." opens with a luxuriant reading of "The Haunted Tree" under the title, "The Erotics of Influence: Wordsworth as Byron and Keats." In this poem, addressed to Mary and occupied with local superstitions about a particularly grand oak tree on the Rydal estate, Fulford finds Wordsworth returning to the Ovidian enthusiasm of his youth in order to both emulate and rebuke the sensual Orientalism of Byron and Keats (and of the Prince Regent). Fulford tends to assume that Wordsworth was rebuking rather than complimenting Keats when--according to Benjamin Robert Haydon--he called "Hymn to Pan" a "Very pretty piece of paganism." Fulford omits Haydon's "Very," making a tonal difference in the remark, but his argument suggests why Wordsworth might have had serious reservations about Keats's prettification of mythology. "The Haunted Tree" displays a consciousness of the sexual violence implicit in the Metamorphoses. Fulford shows very skilfully how Wordsworth's poem marries Ovid's tale of Erisichthon (who assaults a sacred oak) with Burke's deployment of the oak as constitutional metaphor, using that conjunction to upbraid regency voluptuousness. Yet casting Wordsworth "as Keats" might cover a greater range of late Wordsworth, and the chapter also does less than it might to support its claim that late Wordsworth turns from a "landscape of power" to a poetry of "companionship." Chapter 6, "Wordsworth and Ebenezer Elliott: Radicalism Renewed," is a highlight. With ample evidence, superb economy, and deftly nuanced argument, Fulford explains Wordsworth's surprising admiration for Elliott, aka the Corn-Law Rhymer, and how much this admiration influenced Wordsworth's stance in Yarrow Revisited (both in the poems and in the political essay appended to them). In 1836, Wordsworth pugnaciously endorsed what many would consider the antithetical voice of Elliott. "None of us," he wrote (meaning Coleridge, Southey, Byron, Shelley? ), "have done better than he has in his best, though there is a deal of stuff arising from his hatred of existing things." If Wordsworth assumed that Elliott's anger with poverty might amount to encouragement of revolutionary overthrow, he was misinformed (young Wordsworth was certainly more Jacobin than the Sheffield manufacturer); but his pithy verdict--"He is an extraordinary man"--has the ring of truth. So does Fulford's assessment of where Wordsworth stood in the 1830s: "Wordsworth's diagnosis [in the poor laws essay and the accompanying poems] was radical, but his remedy was not" (194). Brief though it is, at 16 pages, the chapter illustrates both Elliott's vigorous prose and what he learned about poetry from the Lyrical Ballads of 1798, with their exemplary "concentration on the specifics of common people's poverty" (200). More surprisingly, perhaps, Elliot is shown not only to have admired The Excursion but also to have recast Wordsworth's portrait of the Solitary into his own accomplished poem about a radical Sheffield preacher named Miles Gordon ("The Ranter"). In turn, Fulford shows, Elliott's troubling influence is felt both in the poem "Humanity," with its denunciation of industrial slavery, and in the 1835 "Postscript." Provoked by Elliott, Wordsworth's poor law essay reaffirms the promise of the Prelude: to write poetry dedicated to "men as they are men within themselves"--while distancing himself from agitation and from those alarming creations known as trade unions. Part 4, "Late Genres," is made up of "Narrow Cells and Stone Circles: Sonnet Form and Spiritual History" and a final chapter on "Evanescence and After-Effect: The Evening Voluntaries." Chapter 7 ("Narrow Cells") is, as one might guess, an elegantly constructed discussion of sonnets in The River Duddon and in Ecclesiastical Sketches, particularly those which belong with the sonnet on "Long Meg" in Fulford's Late Poetry. 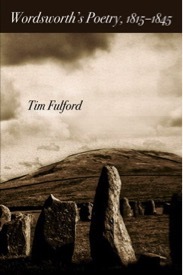 Here Fulford links the form of the sonnet--metaphorically both "orbicular" and resembling "narrow rooms"--to stone circles such as Swinside, as well as to monastic cells and rural chapels. In so doing, he implies that in both of these two sonnet sequences, Wordsworth traces the stream of spirituality in England back through the murky history of the Anglican Church to the still murkier history of the Ancient Britons and Celtic Christianity. The metaphor of a "holy river" implies a "source," but according to "Uncertainty," number V of the Ecclesiastical Sonnets, neither Sharon Turner, nor Taliesin, "Nor Characters of Greek or Roman fame / To an unquestionable Source have led." (Fulford takes these ambiguous "Characters" as letters or runes inscribed in rock rather than historical figures such as Tacitus, Pythagoras and Diodorus Siculus). Wordsworth's confession, in "Uncertainty," that he has vainly "sought the fountain-head" of belief perhaps recalls the remarkable claim he made in The Tuft of Primroses (1808): that the ruins of abbeys "by Severn, Thames and Tweed" stand in memory not only of "Revelation" but also "Of nature's pure religion, as in line / Uninterrupted it hath travelled down / From the first man who heard a howling storm, / Or knew a troubled thought or vain desire / ..." (Tuft, 499--502). Authentic spirituality, whatever the Venerable Bede may have thought, did not begin with the Synod of Whitby. It seems right to call Chapter 8 climactic because (apart from coming last) it is both unified and masterly. In forty-six pages it explicates the seven "Evening Voluntaries," as arranged in Yarrow Visited and in Last Poems, in remarkable depth and detail. To be precise, the chapter offers on average 7.6 lines of commentary per line of poetry, or very nearly a line per word. Why? Because, writes Fulford, the Voluntaries "are original, innovative, thought-provoking, moving--perhaps the most profound meditations on life and poetry-making from the viewpoint of age not just within Wordsworth's own oeuvre but in English poetry up to that time" (287). There is a qualifier in that remarkable eulogy (the last words of this fine chapter) in the words "from the viewpoint of age." But that reservation does not qualify the chapter's opening appraisal, where we are told the Voluntaries "show Wordsworth's technical brilliance at the organisation of syntactical involvement in relation to meter and to rhyme[;] they produce, from the hybridisation of the nature-meditation he learned from Cowper and Coleridge with the couplet style of such poets as Finch and Gray, a revitalisation of poetic tradition"; and in so doing they "forge a new flexible form that was uniquely his" (243). I would not presume to describe any of this chapter's readings. They constitute a master-class. The "pitch of attention" (to recapitulate), the minute attention to each successive short batch of lines, and the unpacking or elaboration of them, can invert what is to my mind the natural precedence of poem over commentary. But with the autopsy over, the poems accrue a status they may never have enjoyed in their long history: that of being vastly subtler and richer than (I would guess) any prior reader of Wordsworth has found them to be. The volume's title does of course beg an overwhelming question: are "Yew-Trees," some inscriptions of 1806-11, four Scottish poems, "Enough of Climbing Toil," "The Haunted Tree," "Humanity," a dozen or so sonnets (from three sequences), the Evening Voluntaries, and "Musings near Aquapendente" sufficient to represent Wordsworth's Poetry, 1815--1845? Fulford cautions readers not to expect either comprehensiveness or unity: "thirty years" worth of writing, he argues, cannot be explored in one book (which is highly debatable) and the varied writings of such an extended period do not produce a single consistent "achievement" (which is undoubtedly true, but equally true of writings surveyed in--ahem-- Wordsworth's Poetry 1787--1814 ). Given the all-embracing title, I especially missed the poetry of the immediate post-war years, from the Thanksgiving Ode and its accompanying odes of 1816/17 (some of which display Wordsworth at his most Shelleyan and Darwinian) to the European Tour of 1820. Why sidestep The White Doe of Rystone (1815) in a work concerned with religion and history and the reinvention of gender, genre, and prosody? Where are Laodamia and those rather shy poems Peter Bell and Benjamin the Waggoner, which made their awkward debut in 1819? The final instalment of "The Recluse"--"Nab Well"--is also conspicuous by its absence, since its cross-cultural meditation speaks to Fulford's interest in non-Christian strands in Wordsworth's writing as well as in what that poem calls "Time's invisible tooth." These, and more sampling of the late flowering of narrative and lyric, too, might have strengthened Fulford's treatment of three themes enticingly flagged up in his introduction: "A poet modifying his writing in light of his younger followers' work," "A love poet of companionate tenderness," and "First and foremost a history poet more probing and more far sighted than any of his time ..." (12). Some minor caveats. If one is going to deploy such terms as "remaindering," "remediation", and "lateness" as critical terminology, one should explain how they are being used. "Lateness," for instance, has a history of transatlantic critical usage that seems different from what Fulford means by the word. The practice of prefacing each chapter and section with lengthy preambles (especially when all begin with variants on "HERE I AM CONCERNED WITH" in block capitals) might be better honored in the breach. Chapter 1, for example, is previewed at length on pages 8, 15, 17, and 20. On page 308, Fulford mistakenly suggests that the scene of lines 686--706 in Book 9 of The Excursion is Swinside stone circle (aka "the sunken church"). That might be very fitting, if only because in book 2 of the 1850 Prelude, Wordsworth ranks pagan Swinside and Furness Abbey as rival temptations to schoolboys on horseback excursions from Hawkshead Grammar School. But the Excursion lines are explicit: the Pastor is imagining "this spacious Mere [Grasmere] / Bedimmed with smoke" from sacrificial fires. Finally, I don't care what MLA says on the matter: recapitalizing Wordsworth's titles is an outrage. Such grumbles aside, Tim Fulford's new book offers much to ponder and admire in its remarkable research, writing, and thinking. It significantly supplements his own The Late Poetry of the Lake Poets, Stephen Gill's Wordsworth and the Victorians (1998) and Wordsworth's Revisitings (2011), and Peter Manning's voluminous but uncollected writings on late Wordsworth. With these, it greatly enhances the ongoing revaluation of what was once called Wordsworth's Anti-Climax. Richard Gravil is Chair of The Wordsworth Conference Foundation, author of Wordsworth's Bardic Vocation 1787--1842 (2/e 2015) and Wordsworth and Helen Maria Williams; or, The Perils of Sensibility (2010), and co-editor with Daniel Robinson of The Oxford Handbook of William Wordsworth (2015), reviewed elsewhere on this site. Leave a comment on Richard Gravil's review.